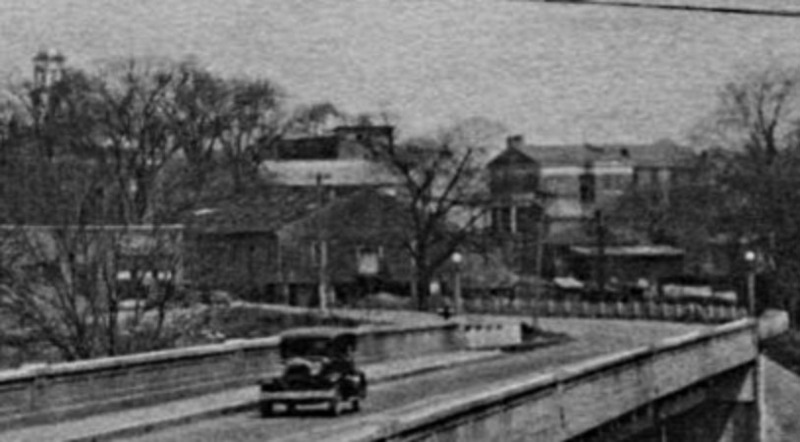 1925-1935, view north across the Eno River. The jail is the two-story building to the right. While a handsome Neoclassical Revival building, I am primarily noting that reports of this building's demise have been greatly exagerated. Stuart Dunaway notes in his "History of Town Lots - Addendum 2015" rather emphatically that "the building shown on the post card does not exist today." 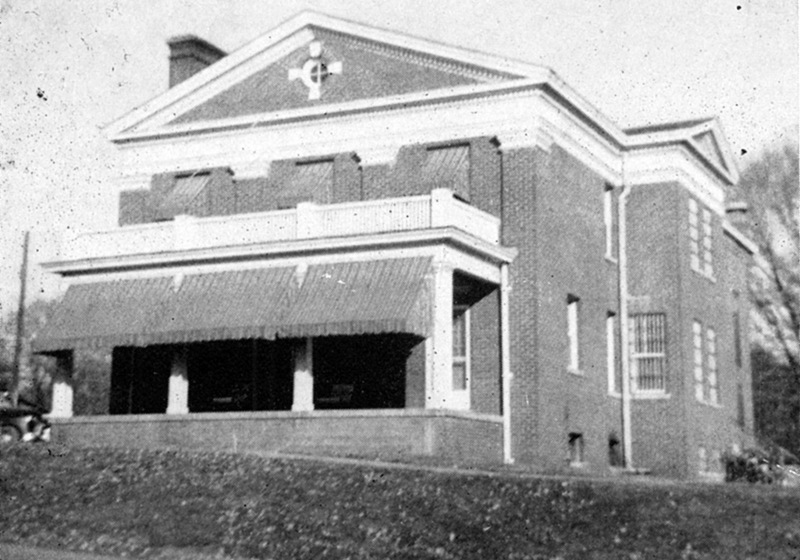 The building was constructed in 1925 as a replacement for the old (fifth) jail that stood on the west side of Court Street. 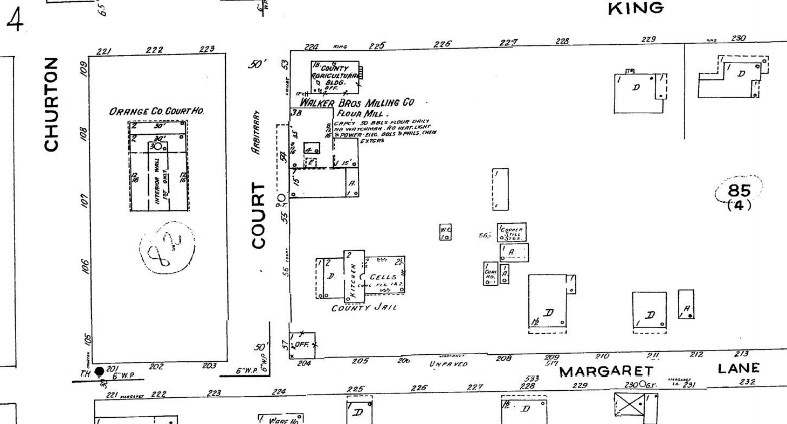 1943 Sanborn map, showing the county jail. "Constructed as the Orange County Jail, this impressive two-story, Neoclassical-style building faces the Orange County Courthouse to its west, but has been significantly enlarged and altered at the north and east. The building is three bays wide and six bays deep with four brick pilasters supporting a wide entablature and a pedimented gable on the façade. The pediment has a denticulated cornice and bulls-eye window with brick voussoirs and keystones in the gable. Two-bay-wide, pedimented wings project slightly from the right (south) and left (north) elevations and there are two interior brick chimneys. The building has nine-over-nine and six- over-six wood-sash windows with a single eight-over-eight window on the left end of the second-floor façade. The nine-light-over-one-panel door on the right end of the façade has a four-light transom and is sheltered by a full-width, hip-roofed porch supported by square columns with a denticulated cornice at the roofline and a low railing at the second-floor level. A number of windows on the side and rear elevations have been bricked in or boarded over. 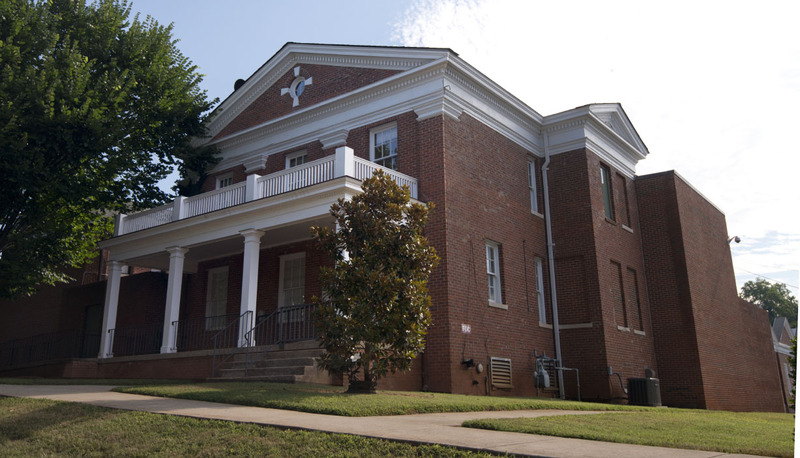 A one-story, flat-roofed wing on the left elevation connects to a two-story, front-gabled brick wing with a pedimented gable which connects in turn to a two-story, side-gabled wing with an inset entrance on the north elevation and a one-story, flat-roofed addition at its rear (east). The building has also been enlarged in 1996 with a series of one- and two-story, flat-roofed sections at the rear, one of which connects to a large gabled wing with projecting gables along East Margaret Street. The side and rear additions have nine-over-nine windows and there is a metal fire stair at the north end. The east addition has a wide cornice and small six-light windows at the basement level. Historically, the deputy lived in an apartment above the jail. I find it silly that this is not a contributing structure to the National Register district. Email the folks in charge.